Do composting worms leave their worm farm? 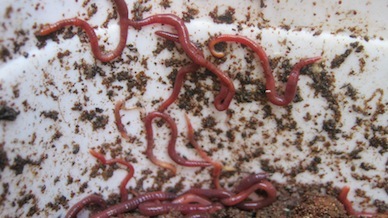 I would like to know if compost worms are often leaving their worm farms? I've raised composting worms for more than 17 years now and in my opinion Eisenia fetida are the ideal earthworm to recycle organic waste. They usually stay in their worm farms as long as the conditions are right but they do migrate often in large numbers if their worm farm is rained on. So if one doesn't make sure that the worms that left the worms farm during a rainy night will be protected once the sun comes up the next morning many or most of them will be lost for good. Therefore it's best to place a worm farm in a rain protected area.